Captain Elliott Neese of the Saga in Deadliest Catch. Arctic Hunter, a crab fishing boat, ran aground on rocks off Unalaska, Alaska, and sent a mayday call to the Coast Guard. Who comes to the rescue? 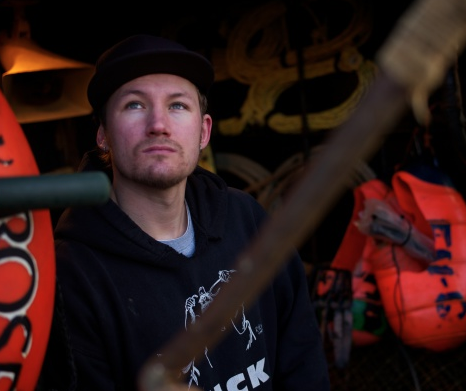 Controversial “Deadliest Catch” captain Elliott Neese aboard the Saga. The dramatic rescue was part of the last episode of “Deadliest Catch,” shown Tuesday. Neese risked damaging his own boat to rescue six crabbers in what was being hailed as a heroic act. AOL.com has more details about the “Deadliest Catch” saga. This rescue was orchestrated by Elliott Neese ... and it's a moment of heroism that fans of the show might not have seen coming. Since Neese often takes to Twitter and other social media and bashes some fans, he's been cast in the role of "villain" by many -- and some people who are feeling less kind just call the youngest captain in the fleet a "jerk." However, after his heroics tonight, his Twitter, which is usually full of nasty back-and-forth messages with viewers, was full of really positive notes. One person even went so far as to say, "Amazing rescue by yourself and your crew. Loving some Elliot this season. Misjudged you." By skillfully navigating the Saga over the very shoals that wrecked the Arctic Hunter and brushing the rocky bottom along the way, Captain Neese and his crew were able to get a line to the bobbing life raft - Captain Neese sent his own father, Mike Neese, into the cold water to deliver it - before the raft drifted perilously close to the dangerous rocks and waves along the shore. All crew members aboard the Arctic Hunter were pulled out of the water and returned to the safety of Dutch Harbor without serious injury. If the Saga wasn't there, the six men would have been stuck on the rocks -- and the worst could have happened. "Deadliest Catch" Is a reality TV series that documents the life of various crab fishermen who risk life and limb while working on the brutally rough Bering Sea. “Deadliest Catch” is in its 10th season.